With the ‘eRay’ concept, the winning team from TU Munich created an aircraft with a consistently integrated turbo-electric propulsion system. Notable features include the propulsion units on the trailing edge of the wings as well as a slightly raised tail plane, which facilitates optimal integration of an electric turbine at the rear of the fuselage. The winning team from TU Munich (from left to right): Alexander Frühbeis, Isa Held, Artur Usbek and Patrick Sieb. This year’s NASA/DLR Design Challenge featured submissions by 41 students from seven teams at six German universities. 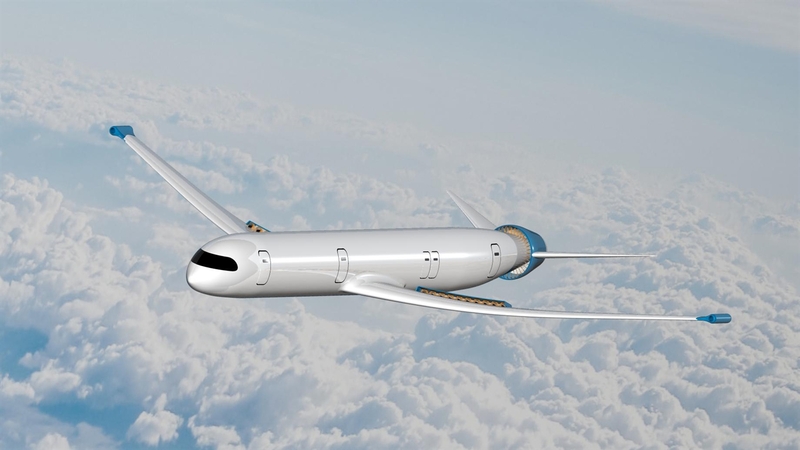 The most striking feature of the Polaris aircraft design by the team from the University of Stuttgart is the integration of an innovative turbo-electric propulsion system that uses liquid hydrogen for fuel. The striking, contra-rotating propellers that are easily accommodated between the side tail planes at the rear of the Polaris hugely raise the propulsion efficiency without increasing the noise emissions. The forward swept wings also reduce aerodynamic drag. 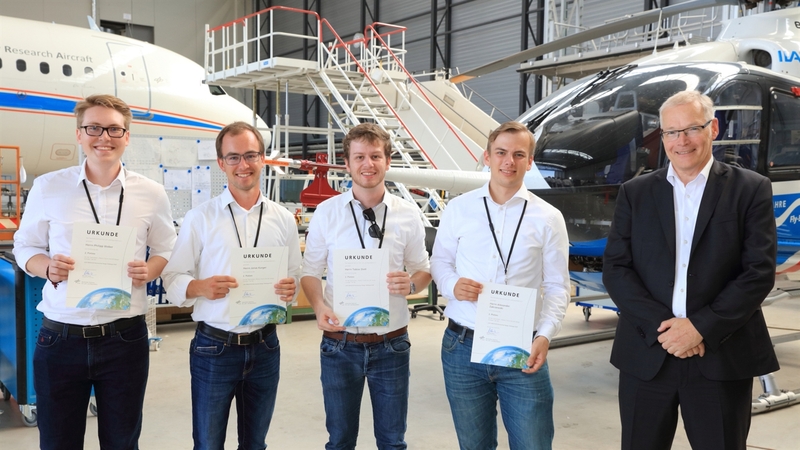 The second-placed team from the University of Stuttgart with Rolf Henke, DLR Executive Board Member for Aeronautics Research (from left to right): Philipp Weber, Jonas Karger, Tobias Dietl, Alexander Zakrzewski, Rolf Henke. The most noticeable feature of the third-placed concept by the team from RWTH Aachen University is the eye-catching wing shape that also gives the aircraft the name ‘AirBox One’. The original approach also includes the external booster module that is attached to the fuselage for take-off and ascent, which can then return autonomously to the airfield. 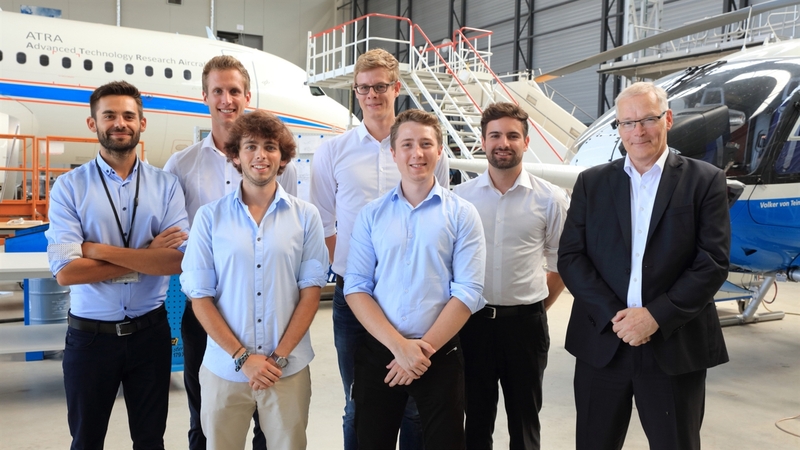 The third-placed team from RWTH Aachen University with Rolf Henke, DLR Executive Board Member for Aeronautics Research (from left to right): Rolf Henke, Joel Rösick, Philipp Podzus, Marc-Antoine Le Gars, Hendrik Fuest. DLR and NASA organised a joint student competition to create the aircraft of the future. The winners received their awards in Braunschweig. The team from the Technical University of Munich emerges victorious. Alternative propulsion and low energy consumption, framed in revolutionary forms. German students are displaying immense creativity and technical skill to design the quiet and eco-friendly aircraft of the future. 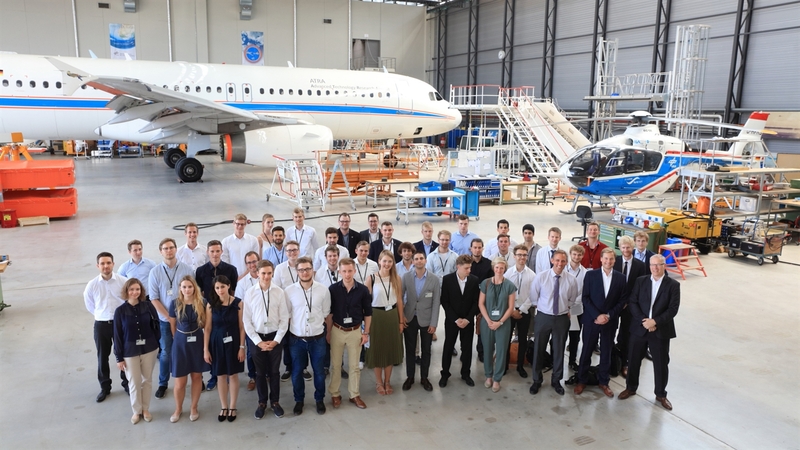 In Braunschweig, the German Aerospace Center (Deutsches Zentrum für Luft- und Raumfahrt; DLR) recently announced the national winners of a competition that was jointly organised with NASA to identify the best ideas for the future of airborne vehicles. This year's German winner is a team from TU Munich. Groups from the University of Stuttgart and RWTH Aachen University came in as runners-up. "The global, international and innovative capabilities of the aviation sector are virtually unrivalled. In the DLR/NASA Design Challenge, two of the world's preeminent aeronautics research institutions are promoting cross-border networks between students in the United States and Germany to bring fresh ideas for the aviation of tomorrow," says Rolf Henke, DLR Executive Board Member for Aeronautics Research. 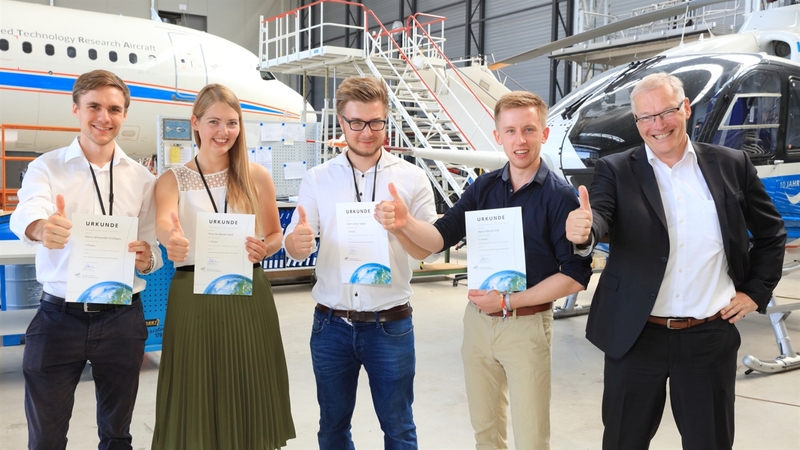 The first prize in this year's competition was awarded to a group of students from Munich for their visionary design entitled the 'eRay Aircraft Concept'. The idea, conceived by a team of four students – Alexander Frühbeis, Isa Held, Patrick Sieb and Artur Usbek – managed to significantly reduce energy consumption and emissions. "The members of the jury were convinced by the consistent and tailored use of various closely coordinated technologies," emphasised Henke. "Overall, we were impressed by the diversity and creativeness of the concepts submitted in the competition. Each team applied a different approach to satisfy the stipulation for a radical reduction in energy consumption." The winning team designed an aircraft with a rigorously integrated turbo-electric propulsion system. Noticeable features of their design were propulsion units on the trailing edge of the wings and a horizontal tail, which facilitates the integration of an electric turbine at the end of the fuselage. "Distributing the propulsion system in this way results in a large number of synergetic effects," says team leader Alexander Frühbeis. "The principle we exploit is called 'boundary layer ingestion', in which the boundary layer, which actually increases aerodynamic drag, is absorbed by the engines to increase efficiency. In doing so, we reduce drag by creating smaller control surfaces." In addition, the structural weight was reduced through the intriguing introduction of an innovative cabin concept, along with active turbulence mitigation. 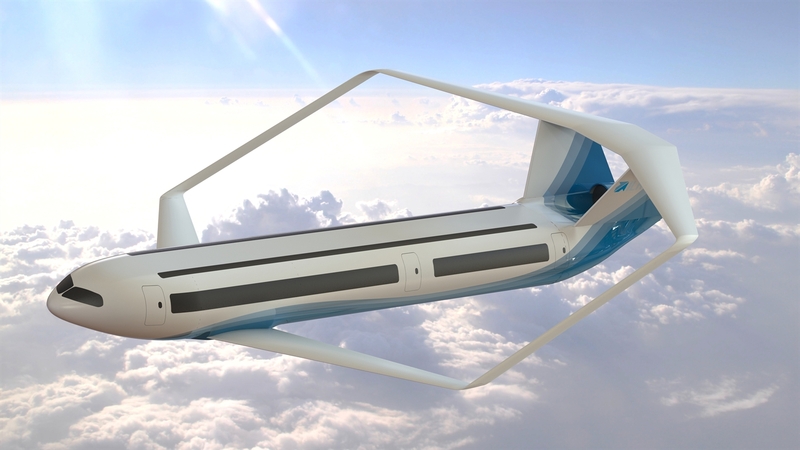 The analyses conducted by the students on the technical and economic feasibility of the aircraft indicate that eRay should be taken seriously as a future aviation concept. Frühbeis and his team estimate a 64 reduction in energy consumption. Second place went to the team from the University of Stuttgart for its concept entitled 'Polaris, Future Aircraft Design Concept'. 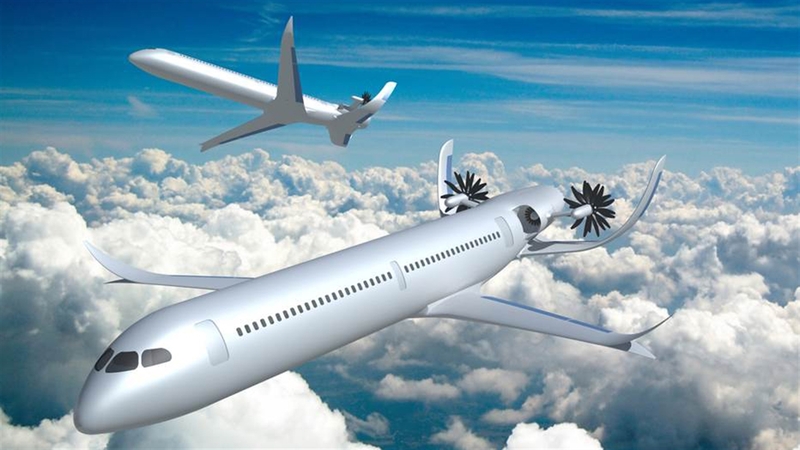 The most striking feature of this aircraft design is the novel integration of a turbo-electric propulsion system that uses liquid hydrogen for fuel. The striking, ccontra-rotating propellers that are easily accommodated between the vertical sabilisers at the rear of the Polaris hugely increase the propulsion efficiency without adding to noise emissions. What is more, the forward swept wings reduce aerodynamic drag. The most noticeable feature of the third-placed concept by the team from RWTH Aachen University is the eye-catching wing shape that also gives the aircraft its name 'AirBox One'. The innovative approach includes an additional external booster module that is attached to the fuselage for take-off and ascent, and which then returns autonomously to the airfield. This means that the aircraft can be operated at cruising speed with significantly enhanced efficiency, achieving outstanding results with regard to energy consumption and emissions. This year's NASA/DLR Design Challenge featured submissions by 41 students from seven teams across six German universities. In addition to the ones taking the top slots, applications also came in from teams representing TU Berlin, TU Dresden and FH Aachen. The number of students participating from a variety of United States universities was also in the double digits. The winning team from Germany will travel to NASA in autumn 2018. There, they will join their peers in presenting their winning concepts at a symposium attended by renowned aeronautics researchers.